One of the things that makes life truly enjoyable is the variation we see in the world around us. Many of us have experienced this since the time we were quite young as we may have had siblings, some of which were bigger and others that were smaller. Through it all, however, we tended to form relationships with our siblings and although we may tussle from time to time, those relationships last for the rest of our lives. Some siblings may show a bit of jealousy when a new arrival takes place. Others, however, embrace the new arrival with love in their heart. That seems to be what is happening with this pitbull. 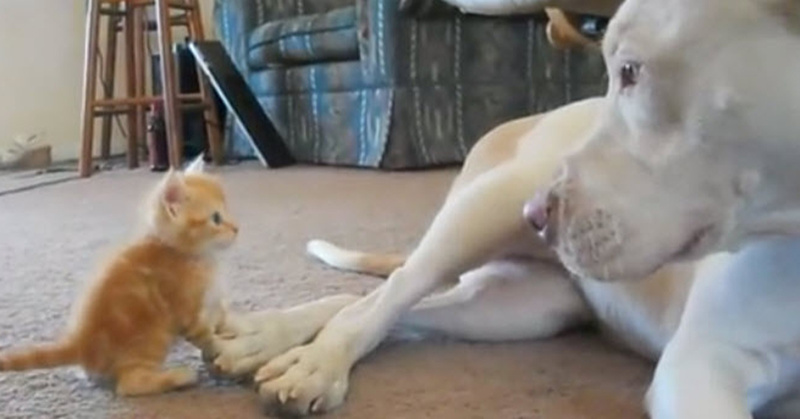 When a tiny kitten was brought into the family, they were put together immediately. As you can see, it was a welcome that will warm your heart. The cat just can’t seem to get enough of her new big brother and there are plenty of kisses to go around.